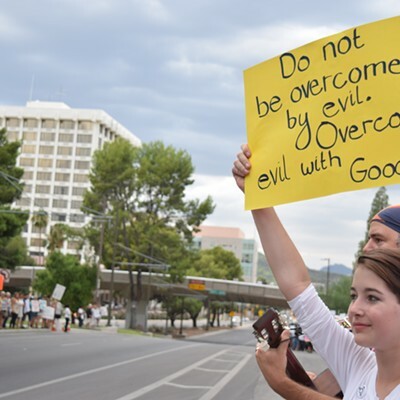 About 600 protesters waving familiar posters gathered in front of Pima County’s Administration Building on Tuesday evening: Refugees Welcome, Black Lives Matter, No Human is Illegal. 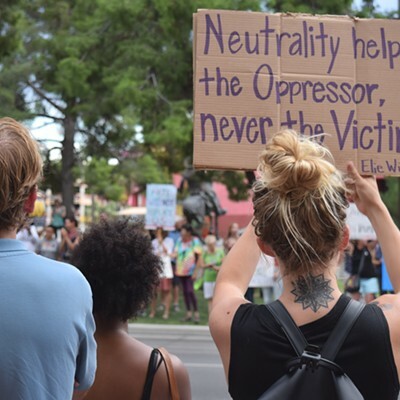 In an age where almost every week, people take to the streets to voice their outrage with the government, people are getting creative. “Dumbledore's Army accepting members” and “Ctrl+Alt+Delete” are a few of the more creative signs. 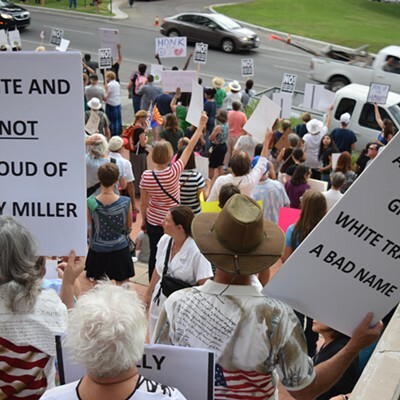 The focus of Tucsonans Against Racism Protest and Rally was County Supervisor Ally Miller, who announced her white pride on Facebook, only hours after a white supremacist mowed down a crowd of protesters in Charlottesville, Virginia, on Aug. 12. For the last week, citizens and fellow board members implored her to apologize for her comments. 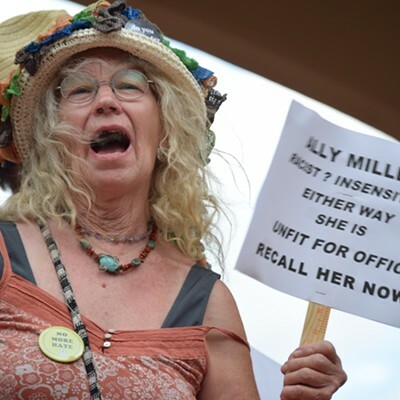 And now it seems the time for apologies has passed, at least for the hundreds that gathered on Tucson’s downtown. People want her gone. 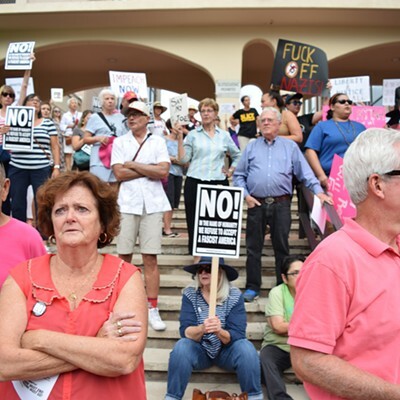 It was no accident this rally was planned on the day Trump addressed supporters in Phoenix. 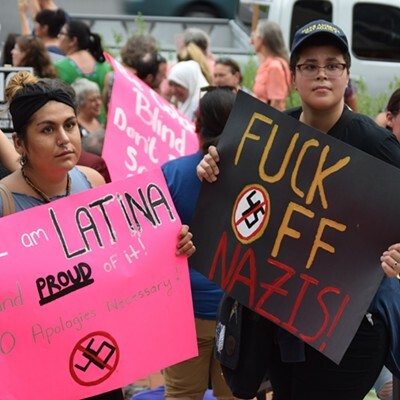 Inside the Phoenix Convention Center, Trump hinted at pardoning former Maricopa County Sheriff Joe Arpaio for illegally continuing racist practices, and Trump decried the “very dishonest media,” blaming them for the backlash to his “many sides” statement following Charlottesville. Outside, thousands protested and were finally dispersed when police set off tear gas into the crowd. 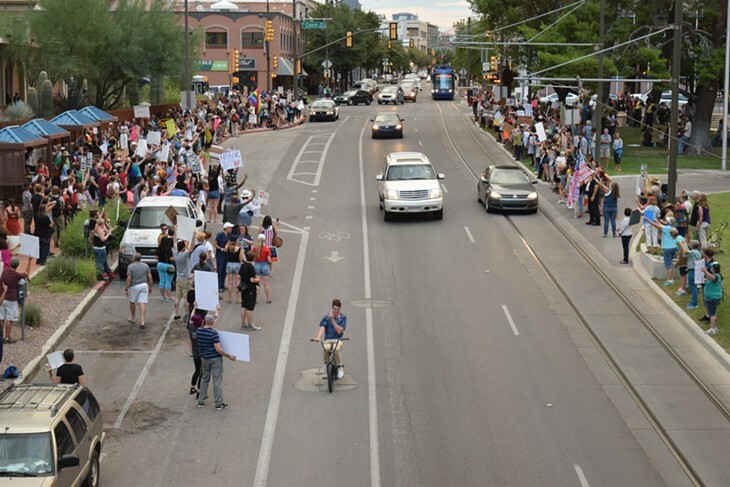 In Tucson, people chanted—families with toddlers in strollers, old ladies waving American flags, teenagers standing up for their future. 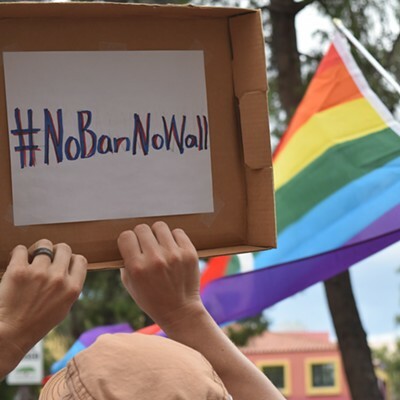 People of every age, creed and color shouted, “This is what democracy looks like,” and held their signs high as cars passed, honking their approval. Kore Press Grrls: Bowden and three participants from Kore's Grrls' Literary Activism Workshop at Cornel West lecture. The mighty Kore Press is a Tucson-based nonprofit independent publishing house and literary justice organization. For 24 years, the press has worked to ensure that marginalized voices: women, people of color, queer and trans folks, have a forum. Founder Lisa Bowden is trying to raise $20,000 for book printing, publishing staff, anthology editorial/artist fees. The Indiegogo campaign has currently raised 13 percent of its goal. Funding for literary endeavors is never easy, and the odds are stacked. Fewer people are reading books for one thing. That, and Bowden and Kore are publishing voices that’d go unheard into the mainstream. Creating a people-powered publishing house has become the most sustainable route for extending Kore Press. A significant portion of the budget comes from support by the NEA, NEH and associated funding sources. With NEA and NEH funding on the chopping block in Trump’s 2018 budget, here Bowden opens up about what mainstream publishing is missing today and what we can expect for Kore Press' fall season. Kore Press has been running since 1993. What made you want to create this press? 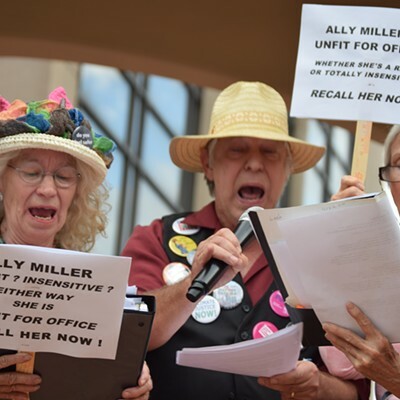 After graduating from the UA and working in the Tucson literary community, I wondered why we weren't exposed to more women writers in school, especially when Tucson is so rich with talent. After working for five years with another press learning printing and binding, and acquiring my own equipment, Karen Falkenstrom, Kore Press co-founder, and I discovered we both wanted to make a feminist/social justice impact with the literary arts, and so, Kore Press was born. The way people consume media has largely shifted to an online format. What is it like running Kore Press in 2017? How has it adapted? We publish online as well as in print, and have been growing our digital presence as reading, activist and communications culture has shifted. Digital printing allows us to keep producing books in much smaller runs of our titles, which is more economically feasible for small presses. What does Kore Press look for in a prospective author? We are focusing in recent years on writers who are interested in experimental forms, or content, that have potential for social impact. We have done, and plan to continue doing, community programming around certain artists or works to create larger public conversations which engage folks in innovative ways. What is mainstream publishing missing? Why aren’t marginalized groups able to tell their stories in that forum? Mainstream publishing is commercially driven, market-driven, so, it's missing a lot in terms of diversity. That is and has always been the strength of small presses—to take risks, work with all kinds of writers and voices. With the proliferation of social media and personal technology, we have experienced a democratization of "publishing"—anyone with access can tell their story, can have an audience. Mainstream publishing, like mainstream media of all kinds, is largely governed by corporate forces, so you tend to see the same issues of systemic racism, sexism, capitalism—intersecting oppressions—that we see in large institutions and governments. The Secret Sisters play an Americana Ladies Night at SXSW. 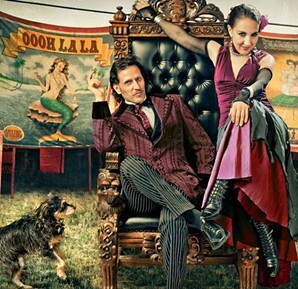 It's the first time Lydia and Laura Rogers bring their melancholy old-timey ballads to the festival in Austin, Texas. 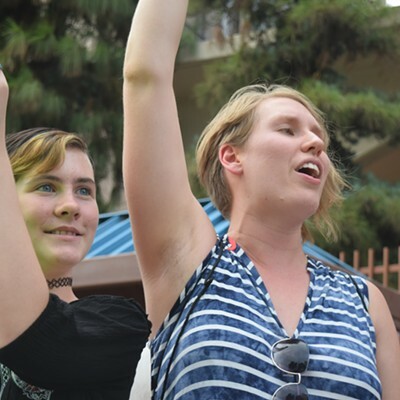 The Secret Sisters are as joyful on stage as their songs are depressing. Laura and Lydia Rogers love the dark days. “We sell antidepressants at our shows,” Laura jokes on stage at Cooper’s BBQ’s Americana Music Association showcase, which became Americana Ladies’ Night when the organizers realized all their headliners were women. The huge head of a longhorn bull looks down on them as they harmonize with a rapturous twang. Over 100 people sit on the floor, fill the tables and stand along the walls. The whole room is silent, enchanted. Between songs, Lydia tunes her guitar, and Laura chats with the audience, joking and telling stories. Chewing gum, she tells them about meeting the Everly Brothers. Laura says she was so excited, she burst into tears, and they weren’t pretty tears. She looked like she’d “just been born—red and shiny and wet." The sisters love music from another time, and most of their favorite musicians are dead. It shows in their music—an old-timey feel with a sadness that’s older than they are. “And now we’re going to segue into happier material by playing a murder ballad,” Laura says. It’s a sequel to their first murder ballad and will be on their next album, “You Don’t Own Me Anymore,” produced by Brandi Carlile and out this summer. The women get a lot of their inspiration from failed relationships, which is why Laura hasn’t written a song she likes since she got married to a “redneck from Alabama” last April. So they play the last good song she wrote: “He’s Fine,” about the last man who broke her heart.